Choosing the right location for your wedding is one of the most important and often the most challenging decisions to make. Let your imagination run wild at Connecticut’s Beardsley Zoo! Celebrate your special event in one of three unique spaces, including our Victorian Greenhouse, rustic Hanson Building or large Carousel Building with an indoor working carousel. Whether it’s your ceremony, reception, or rehearsal dinner, we are sure to have a venue to meet your wedding vision! View our wedding gallery below. How many people can each venue accommodate? Do you have any photos I can view? Click here to see the details on capacity for our buildings and pictures of other events held in them. What does each venue cost to rent? Rates are based on a four-hour rental and can be adjusted according to the length of your event. Click here to see our rental rates. What type of deposit do you require? We request a deposit of 50% of the site fee at the time of contract signing and the remaining 50% due the week before the event. Do you have an on-site caterer? No, we do not have an on-site caterer. However, we have compiled a list of caterers who have worked with the Zoo in the past and are familiar with the requirements of the Zoo. Click here to view our list of preferred vendors. Do I need to choose one of the Zoo’s preferred caterers? You are not required to work with these caterers. We provide this list as a convenience to you. If you have a caterer who you would like to use that is not on this list, they will need to contact us to make sure they have the proper documentation we require. Can we have alcohol on Zoo grounds? Alcohol is allowed on Zoo grounds during evening events. Your caterer or server will need to provide the Zoo with their insurance certificate of liability. In the event your caterer or server does not carry an insurance certificate, we can provide contacts to licensed bartenders for your event. Alcohol is allowed during the day in our Hanson Exploration Station only. The same insurance liability requirements apply for daytime events. Can I hold my wedding in the evening at the Zoo? All of our venues are available in the evening from 5:00 p.m. to 11:00 p.m. year-round. You may also choose to rent the entire Zoo, allowing for all exhibits to be open for your guests to enjoy, keep only specific exhibit areas open or have one of our animal handlers give a tour of an exhibit area for an additional charge. Do you only host evening weddings, or can we hold our wedding during the day? Yes, the Zoo can host a daytime wedding, however, we are open to the public between the hours of 9:00 a.m. to 4:00 p.m. Our lush gardens and unique buildings provide a wonderful backdrop for an unforgettable event. Daytime weddings are especially beautiful in our outdoor areas. 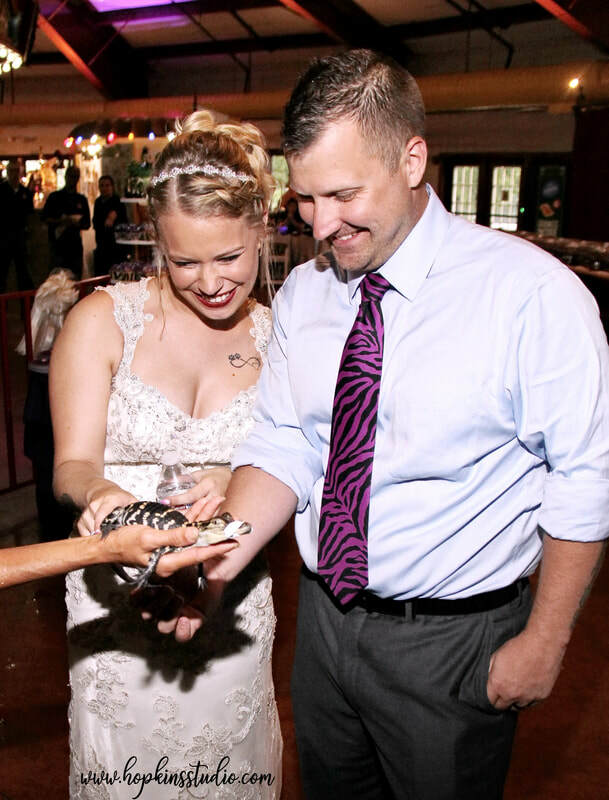 Your guests will have full access to visit the Zoo during your event. How do I book a tour of the property? Tours of the venues are done by appointment. Call our Rentals & Events Department at 203-332-4243 to book a day/time. Can I have an animal at the wedding? Our Education Department may be able to provide an animal for viewing and discussion. Guests might be able to touch the animal. Additional charges will apply. For prices and details, visit our Rates & Details or Event Guidelines. For more information or to make reservations, please email ldurkee@beardsleyzoo.org or contact our Rentals & Events Department at 203-332-4243.